Irresistible Italy is held in high regard by holidaymakers the world over. While your brain might be busy dreaming up visions of majestic, misty rolling hills and relics of Roman rule – there's a less celebrated, sandier side to these ancient landscapes. 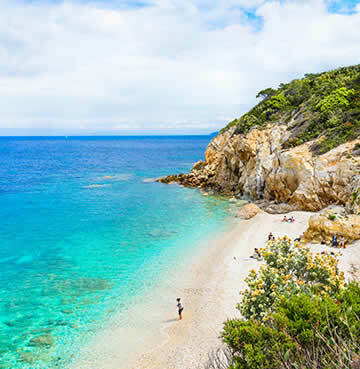 From the wild and windswept bays of Tuscany to an exotic slice of Sardinian paradise, here's the inside scoop on the best beaches in Italy. When you think of Tuscany's trademarks, the beach might feel like an afterthought – but think again! From rolling, romantic hills to swathes of sandy shores, it'd be a cardinal sin to overlook the wave of wonderment on Italy's northern coastline. With more than a few tricks up its sleeves, make some room on your bucket and spade list for wild, unspoiled bays and summertime seaside hotspots. In Tuscany's extreme south you'll find the tiny island of Monte Argentario. Connected to the mainland by three sandy stretches, this scenic little corner of Italy still remains a well-kept secret. Peppered with pristine beaches, hideaway bays and cute little coves, there's a sandy sweet spot for everyone! Feniglia claims 'the best beach' crown by those in the know. Boasting welcoming, warm waters, flanked by sweet-scented pines and powder-fine sands – it's no wonder the Blue Flag flies with pride here. You'll find this beauty on the most southern isthmus that separates Orbetello Lagoon from the Tyrrhenian Sea. Explore magnificent reefs beneath the waves, or cycle the 10km spacious strip from end to end. If your idea of holidaying calls for a few extra comforts, you'll be able to hunt down a couple of beach clubs with bars, restaurants and sunloungers. Bellissimo! Another waterside win is the sprinkling of sand at La Cantoniera. Favourited by locals, it's within walking distance of the buzzing port of Porto Santo Stefano on Monte Argentario's northern coast. Crystal-clear waters greet the gently sloping shores for a match made in paddling heaven. Nestled between craggy cliffs carpeted with luscious forest, welcome to your personal slice of back-to-nature paradise. 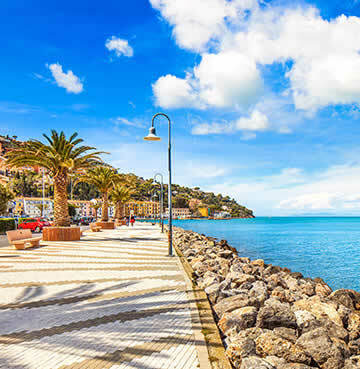 When you're ready to leave the pin-drop peaceful cove for something a little livelier, saunter back to Porto Santo Stefano's pretty promenade. Chic but discreet, there are countless eateries, ornate architecture and mesmerising views overlooking the glittering sea to be enjoyed. Not to mention a maze of alleyways just waiting to be discovered in the town's historic centre. 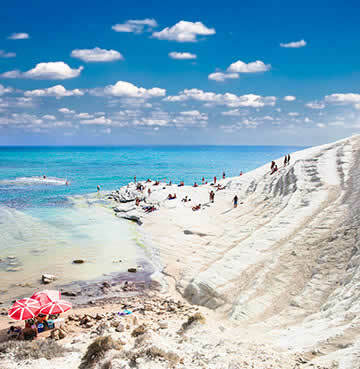 Nothing will capture your heart quite like Sicily's southern coast beauty, Scala dei Turchi. Shaped by the sea and salty coastal breeze over thousands of years, the area is an ever-evolving work of art. Literally translating to 'stairs of the Turks', Scala dei Turchi has been subject to a barrage of Turkish pirate invasions – with raiders making the most of Mother Nature's limestone staircase. Visitors can follow in their footsteps and scale the spectacular stretch of Sicilian shoreline in search of the perfect sunbathing spot. If you're searching for Sicily's poster-girl of swoon-worthy seaside spots, then look no further than the elegant east coast town of Taormina. Perfectly perched on the foothills of mind-blowing Mount Etna and teeming with historical remnants of Greek colonies, there's very little this picturesque place doesn't offer. Quaint squares are dripping with flowers, atmospheric ancient theatres watch over breathtaking views and the blissful beach of Isola Bella lies below. This small beach extends out into a little islet of the same name, connected by a thin strip of pebbles that disappears underwater in high tide. The sea glitters in turquoise tones under the sizzling Sicilian sunshine, and with crystal-clear visibility it's an oasis of underwater discovery for budding snorkelers. Scope out the stunning seabed in search of mesmerising marine life and out-of-this-world volcanic formations. All heel Puglia! The stiletto to Italy's boot, these southern shores do their best to take the crown. Blessed with over 750km of coastline and lapped by both the Adriatic and Ionian seas, it's a bona fide sweet spot for stunning strands of sand. 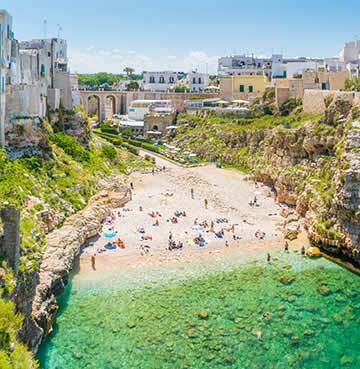 From wonderfully wild rocky coves to seductive seaside towns, a villa holiday in Puglia is the perfect base to explore the treasure trove of beaches on offer. Head south in search of Gallipoli's golden bays and gentle seas and you'll soon see why La Puritá (the beach of purity) pulls in beach lovers from all over Puglia. Iridescent shades of blue and green kiss the crescent-shaped shore, where the sand is so soft that locals liken it to the Maldives. While you'll have to judge that for yourself – one thing's for sure… the sunsets here can most certainly hold their own. Ancient city walls and the charming streets of the old town watch along with you as fiery tones dance their way across the sky into dusk. 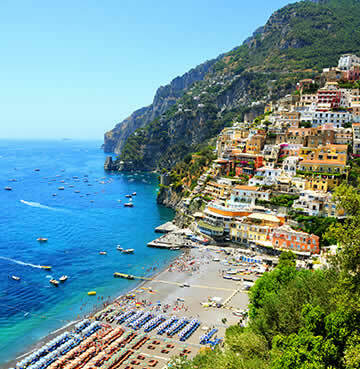 Complete your holiday coastal collection with a jaunt to the jaw-dropping Amalfi Coast. This bucket list beauty needs little introduction, chock-a-block with cliff-backed beaches accessorised with candy-coloured towns, it's one of the Mediterranean's most memorable destinations. Stretching out for 50km, the Sorrentine peninsula is nature's long, breathtaking balcony. Here you'll find soft, white sands are so last season – Amalfi's beaches are all about dark, volcanic tones. Nestled between glittering seas and majestic mountains, rows of vibrant parasols are arranged meticulously on postcard perfect coves. Fishermen's boats bob hypnotically in sleepy harbours, while the jet-set elite flock to buzzing resorts with their luxury yachts. If you 'do like to be beside the seaside', then this is your ticket to doing it in style! The gorgeous seascapes of glamorous Positano are among Amalfi's most iconic. Marina Grande Beach is a brochure staple for Italy holidays and one of the most coveted stretches of coast in the world. Surrounded by soaring cliffs and chic boutiques, grab your favourite sunglasses and get ready for a taste of la dolce vita. Between rubbing shoulders with celebrities and mingling with the locals, it's a once-in-a-lifetime town to top up that tan! Of course it doesn't have to be all glitz and glamour, there are plenty of heavenly hideaways and quieter coves speckled along the coast, as well as magical Mairoi – the biggest beach of the bunch. Ideal for families or anyone looking for a little more space, it's one of the few sandy spots in the region. You'll find plenty of eateries at the water's edge, plus a tonne of ways to entertain the kids. From canoes and pedalos to boat excursions to nearby Grotta di Pandoa sea cave. Life's a beach on Sardinia, literally! Even the Italians take their hats off to this idyllic island, and with such a healthy supply of silky smooth bays it's no wonder why. Set in the heart of the Mediterranean, you'd be forgiven for thinking you hopped on the wrong plane and landed in the Caribbean. Turquoise seas and whiter-than-white beaches are the name of the game, with something for everyone – from solitude seekers to action and adventure addicts. Your eyes will hardly believe what they're seeing as you gaze upon the glorious powder-white sands that grace the shores of Spiaggia della Pelosa. Met by a shallow turquoise sea, this beach pulls off exotic charm with awe-inspiring finesse. 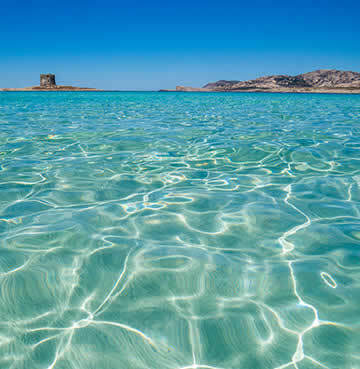 Bound around barefoot or wade into the welcoming waters, either way this Sardinian oasis will dazzle even the hardest to please in your holiday party. As if all that wasn't enough, the bay comes complete with dreamy views over Isola Piana and its 16th century watchtower, the Torre della Pelosa. For those who struggle to sit still all day, you can rent surfboards and canoes to explore the spellbinding scenery. Sardinia's east coast is home to a collection of must-see coves, honeycombed with grottoes and limestone cliffs. Jagged rock formations rise from topaz tones with dramatic brilliance, sheltering the scenic shores and keeping them as nature intended. Rock climbers can often be seen scaling the soaring rock face, while snorkelers get up close and personal with local marine life. Italy doesn't do things by halves, throwing in nearby Cala Luna, Cala Biriola and Cala Mariolu beaches for good measure! Brace yourselves for Blue Flag heaven, because Le Marche boasts the highest number of bannered beaches anywhere in Italy! This is the place to plonk yourself if you're in dire need of peace and quiet, where it's not beyond the realms of possibility that you'll find a deserted beach all to yourself. Untamed and wild, there's too many first-class seaside spots to list thanks to 180km of Adriatic lapped coastline. Revered as the cream of the crop, the Conero Riviera claims the title of Le Marche's best beaches. Sitting pretty at the foot of Mount Conero, there are no less than four sandy sweet spots to roll out your towel. Kitted out with all the facilities to make your life as easy as possible, Portonovo's Molo beach comes complete with a picture-perfect reflection of the majestic mountain that towers above, as well as unobstructed sunset views. For those looking to get off the reservation, rugged Mezzavalle beach can be found at the end of a scenic footpath, where you'll be rewarded for your efforts with tranquillity and seclusion. 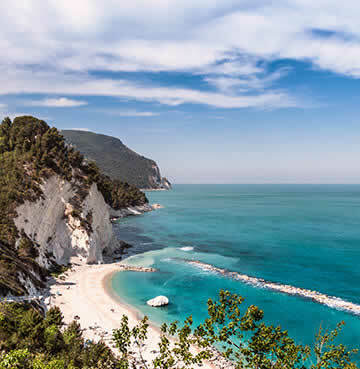 A little further along the coastline photographers will have a field day at Le Marche's iconic Due Sorelle beach, which earnt its name from a pair of sea stacks that jut out of the crystal-clear water.